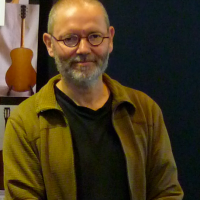 Jacky Walraet honed his lutherie skills at the renowned “CMB" school in Belgium, where he has since amassed over 25 years of experience as a teacher of steelstring guitar building. Early on, he had the fortune, honour and pleasure of working for several big names in the Jazz world and quickly established a firm reputation. As founding member of the LGR-Project he has gained considerable experience regarding the use of alternative local and non-tropical woods in guitar making. More recently Jacky has concentrated on creating new designs, hand crafting a limited number of unique instruments, each with its own one-of-a kind visual and sonic characteristics.